Research firm iSuppli today announced a significant boost to its iPad estimates through the end of 2012, pushing its total estimates for the first three years of product availability to nearly 100 million units. iSuppli pegs 2010 sales at 12.9 million units, up significantly from an initial "conservative" estimate of 7.1 million issued at the device's initial launch in early April and on pace to capture an astounding 84% share of the tablet market for the year. Over the slightly longer term, the firm has pushed 2011 estimates from 14.4 million to 36.5 million and 2012 estimates from 20.1 million to 50.4 million. "The iPad is shaping up to be the 'Tickle Me Elmo' of the 2010 holiday season, with product demand expected to vastly exceed available supply," said Rhoda Alexander, director of monitor research for iSuppli. "Apple has hiked its iPad manufacturing goals to suppliers across Asia. As iSuppli stated in its initial forecast, the key to continuing success will be how quickly Apple responds to issues as they arise and whether the company can align suppliers to meet demand needs. 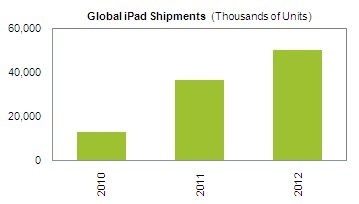 Apple's acceleration of its component demand indicates that the company has raised its iPad production target for 2010. Our latest research indicates there is much higher production than previously expected for two key components: LCD panels and NAND flash." The report notes that manufacturing production is essentially the primary limitation on iPad sales at the moment, with the company struggling to meet strong demand for the new device. Apple is expected to continue to increase production capacity, however, with increases in both production capacity and yield rates for the device's touchscreen particularly helping to ease the supply crunch. iSuppli predicts that Apple will revamp the iPad in April 2011 to match the yearly upgrade cycle seen on Apple's iPhone and iPod touch devices. The firm predicts that the next revision will see the addition of a camera, which would appear to be highly likely given Apple's apparent plans to roll out FaceTime video calling to other iOS devices beyond the iPhone, as well as possible new models in various sizes as has been rumored.